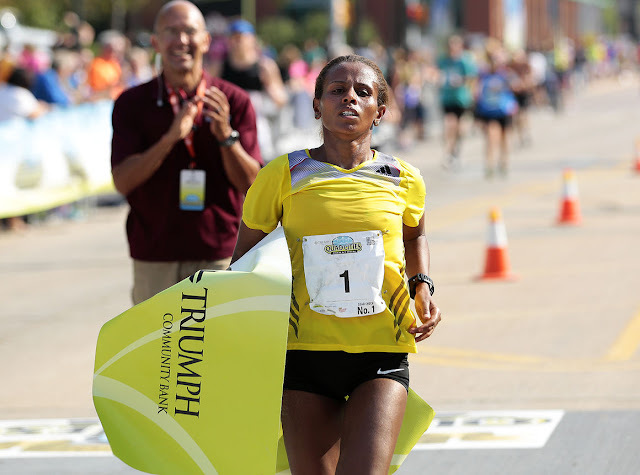 As Hirut Guangul, of Ethiopia, crossed the Quad Cities Marathon finish line as the first woman overall for the fourth consecutive year, she crossed her arms above her head in an "X". Guanhul became the first QCM four-time champion, but the moment became larger than just her athletic achievement on Sunday morning. "I like this race," said Guanhul. "Four-time champion. I'm very, very happy." After the race, the 24-year-old said the "X" is a way of protesting the human rights abuses that are taking place in Ethiopia. Guanhul's simple action is a brave and powerful one that bypasses any language barrier. Hundreds of peaceful Ethiopian protesters have been killed or arrested by the Ethiopian military this year. Protesters have demanded equality for the country's Oromo people, Ethiopia's largest ethnic group that has felt marginalized by the government as it pushes them off their land before selling it. Ethiopian runner Feyisa Lilesa held up an "X" with his arms as he won silver in the marathon at the Rio Olympics. The gesture has been used as a symbol of strength and peaceful resistance. Lilesa says he likely will not be able to return home after making the gesture of solidarity. The Oromos also have used the "X" as a sign of their protest. "The Ethiopian government is killing my people, so I stand with all protests anywhere, as Oromo is my tribe," Lilesa said at an Olympic press conference. "My relatives are in prison, and if they talk about democratic rights they are killed." Guangul joined the brave movement as she won the women's marathon with a time of 2:44.25. She won her first QC Marathon in 2012, when she set the women's open course record of 2:35.07. Guangul's 2016 win earned her $3,000 in prize money. Guangul says she enjoys the Quad Cities Marathon, and is happy to be back at the race. Kenyan Bizuwork Getahun Kasaye (2:56.01, $1,500) placed second and Ethiopia's Meseret Ali Basa (3:03.09, $1,000) was third. Jenna Fiorillo (3:16.03, $750) of West Cester, Pa., placed fourth as the top American finisher.